Detect fraudulent bills quickly and effectively with our Sure ‘N Fast TM counterfeit detector pen. This pin is the ONLY counterfeit detector that detects counterfeit bills printed on genuine treasury papers, newspaper, recycled paper, calendared paper and many other paper types. Effective on many foreign currencies. I knew eventually that I would need one of these pens. SO SO GLAD that I got it. I recommend every business owner gets at least 3 or 4. It is comforting to know I have another tool to protect me from be taken advantage of. Daughter loves this at the store. she thinks it is the best thing. I feel all business owners need this and Store Supply has the best price. Great product, Can't beat the price!!!! Nothing worse than being passed a bogus bill. This pen will help prevent those emotional and financial drains. Exactly what I was looking for at a very affordable cost! This is an invaluable tool for someone taking in large bills. These are good to have if you get a lot of larger bills. It works as it should. This pen is easy to use and very helpful. Not a bad price either. This product is a step up from the traditional counterfeit detector pen because it can identity counterfeit money that has been printed on genuine currency paper. I feel safe taking large amounts of money now. Easy to use. This is a great product to protect yourself from fraud. Something I've been going to buy at the bank; but, kept forgetting. I just added to my sales pad order! A must have for anyone that takes cash!! works great! 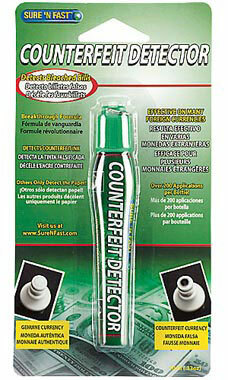 Keep cash transactions safe with this counterfeit detection pen. This counterfeit detector pen works differently than others. Instead of marking a bill and looking for the mark to change colors, this pen actually tries to dissolve the ink on the paper. It works on US and foreign currency. I haven't taken a counterfeit bill yet, but I'm sure this pen will catch it when I do. Retailers should be familiar with and look for the currency's security features first, then use this pen if they have doubts. When you are checking a customer out after a sale and are taking their money. What if the paper currency is counterfeit? This pen gives you a quick way to check out your larger bills or ALL of them as far as that goes, by seeing if the money reacts to the pen. This pen could save you a lot of headache and loss of monies. Just a little swipe and rest assured that you aren't being taken with phony money.